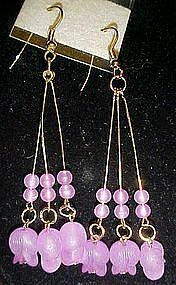 Thes are a pretty fuschia color and they way they are made reminds you of the flower itself, Bottom beads are shaped like a fuschia. Gold tone pins and earwires. Excellent condition, still on original card. 2 1/2" long plus ear wire.